This evening, various public buildings and famous landmarks will be lit up with the iconic Glider violet colour. 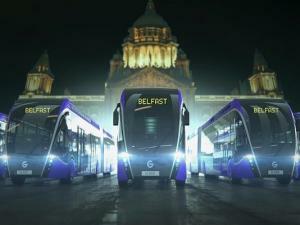 It's to help mark the countdown to the new transport service for Belfast. Buildings to be illuminated include Belfast City Hall, Victoria Square and The Big Fish; as well as CS Lewis Square, Culturlann McAdam Ó Fiaich and Lagan Weir Footbridge. This new service will be the first to deliver a route that runs between the East and West of the City, as well as the City Centre and Titanic Quarter. Translink's now in it's final stages of testing and has been giving members of the public the chance this week, to try out the Glider vehicles ahead of the official launch on Monday.